Pillars are often used as décor ensembles anywhere from your backyard, inside your home, or any themed event. 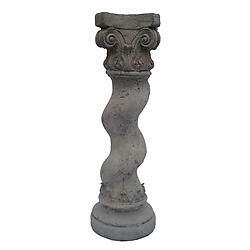 This is a beautiful pillar that has been constructed from Roman crushed stone. It is full of intricate details that pop and are sure to wow any audience. Dimensions: L12.50" x H36.50" x W12.50"